SermonAudio.com | SermonAudio Tip: e-Sword Bible Software Integrates with SermonAudio! e-Sword Bible Software Integrates with SermonAudio! New! Now with Mac Integration! From Rick Meyers: The SermonAudio.com button on the toolbar will take them to the selected sermon’s landing page, or if no sermon is currently selected, then it will take them to www.sermonaudio.com instead. Thanks again for letting us share these wonderful teachings! 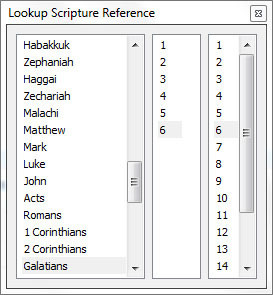 This means that while you are doing your Bible study or sermon preparation, you'll quickly be able to see all relevant MP3 sermon titles directly from SermonAudio.com for that particular Bible passage. It's convenient and the best news is that this feature is completely free of charge to both the e-Sword end-users and to our broadcasters! Download the latest version of e-Sword now completely free of charge..
Built-in player. The e-Sword integration features a built-in audio player so you don't have to leave the program! Enjoy the sermon using familiar controls. Click on the SermonAudio logo to jump directly to the sermon page on SermonAudio.com to learn more about the sermon and its broadcasting church. Jump to any passage. The sermon window will automatically show you the sermons based on your current passage view. Use the menu option to quickly and conveniently jump to a different passage at any time! So, broadcasters take note! When new sermons are uploaded to SermonAudio, they will automatically also appear in the "Tools/SermonAudio.com" menu of the e-Sword Bible Software! What a great way to reach Bible students and scholars who are already searching for sermons and other great resources by Bible Reference! e-Sword is a fast, free, and effective way to study the Bible. With over 25 million users in 230 countries, e-Sword is feature rich and user friendly with more capabilities than you would expect in a free software package. All that I can say is 'WOW!' regarding this software. May our great God bless the people who labored to bring this to his people. Apparently the folks more familiar with e-Sword should make comments about it. I did find the RV, which is the official Anglican Church update to the KJV. I least from what I read it's suppose to be better than the ASV. I found the KJV-1611 with The Apocrypha [URL=https://www.jashow.org/wiki/index.php/The_Apocrypha_and_the_Biblical_Canon]]]The Apocrypha and The Biblical Canon[/URL]. It was listed after all the for-sale Bibles, this one is free. What is was good is that my WEB Bible with the Apocrypha, displayed these Catholic books correctly after I installed the KJV-1611 module. So, I was glad it was still there! If you have an e-Sword with KJV-1611 module make sure you put a copy of that off somewhere, I can no longer find that module for e-Sword! Perhaps there was a copyright problem? Ah, copyrighting a 1611 Bible -- in the USA, anyway? The same place you have the marginal notes modules you can find other modules such as the American Tract Dictionary, and a module installer. I would suggest you look over that site. Anyway, on his latest e-Sword program I did see he does have a SermonAudio section, There's no reason you can't have more than one Bible program on your computer. I do. I have used e-Sword almost since it first became available, and I have not found another program that begins to compare. Reading about the capabilities of the latest version, gives me mixed feelings. Those capabilities would provide an excellent tool, but only users of the latest version. For all of the people who use the older version, that would entail us repurchasing plugins,programs and add-ons we have already purchased, but cannot be used inside the latest version. Some of those are not even available anymore. I wish more consideration would have been taken in dealing with the millions, (as I understand it), that are in this same situation. Sorry to hear about that Cindy, if it costs money, I don't get it. But, I usually keep a copy of it on a computer or two, to get some things I couldn't get otherwise, e.g., the real true blue, 1611 KJV, which is free etc. I just got use to using Crosswire stuff, so I never got to use e-Sword on a regular basis. But, SA has inspired me to download this latest, free version. Just downloaded the e-Sword latest version today and was really impressed. I had been using WORDsearch 7 and there is no comparison.One of the little things I like is the ability to increase the text size so it's easier for an old guy like me to read.Another is the number of downloads available,by far superior to anything I've used. While the main --free-- Bible program that I use is from [URL=http://www.crosswire.org/index.jsp]]]The CrossWire Bible Society[/URL], e-sword has done it again by adding another feature, which to the best of my knowledge their programs don't have. So, I do have E-sword on some of my computers for such things as King James Apocrypha, I really do have to glance over the Maccabees section , So good show SA and E-Sword, giving many Christians a more varied source of material to study. Thank you to everyone involved, what a Blessed resource to have, we download sermons and give them out to anyone who expresses a hunger for Gods Word,also to folk that dont. Sermon Audio has been and will continue to be a great source of enlightenment, we have been greatly encouraged and strengthened by your ministry.Thanks again to ali involved. Well since some of my esword pluging are only compatable with version 8, and some I no longer have the keys for, I'll be unable to use this. Just as I'm unable to run esword 9 or 10. Esword is a great program and this is a nice feature but a shame that esword saw fit to not make the older plugins which many people rely on able to be upgraded to the new format without buying plugins all over again - some of which simply are not available for the new version. Wow! This is an exciting new feature for e-Sword. I have an older version of e-Sword set up under WINE in Linux - it works great - this may make me upgrade. Anyone who hasn't used e-Sword ought to check it out, particularly for the integration of the Bible text with study resources like Strong's, Matthew Henry, etc.